Lamar University and the Beaumont Foundation of America have announced the 15th in a series of Southeast Texas Legends Scholarships, this one honoring Walter Umphrey, founding partner of Provost Umphrey Law Firm. 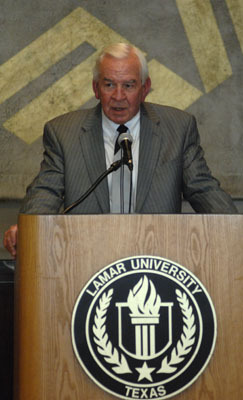 The $100,000 endowed scholarship will assist underserved Lamar University students, said Lamar President James Simmons. Born in Port Arthur, Umphrey received a football scholarship to Southern Methodist University then completed his bachelor's in business administration degree at Baylor in 1959. 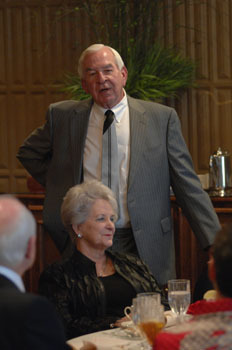 Umphrey worked as an insurance adjustor before entering Baylor Law School and earning his Juris Doctorate degree in 1965. Umphrey's dedication to the law in conjunction with the rights of individuals was inspired while being reared in the home of a justice of the peace. He began his career as a prosecuting attorney and ultimately Chief Felony Prosecutor for the Jefferson County District Attorney's office. He founded Provost Umphrey Law Firm with partner David Provost in 1969. For more than forty years, Provost Umphrey's mission has remained to seek justice for those suffering from a personal injury, wrongful death or other legal wrong across Texas and nationwide through their lawyers in Beaumont and Houston, Little Rock, Arkansas and Nashville, Tennessee. Umphrey is a member of the American Board of Trial Advocates and admitted to practice before the U.S. Court of Appeals for the Fifth Circuit, U.S. District Courts for the Eastern and Southern District of Texas, and the United States Supreme Court. His legal affiliations include the Port Arthur Bar Association, Jefferson County Bar Association, Texas Trial Lawyers Association, the American Association for Justice, American Bar Association and State Bar of Texas. He is a Fellow of the International Society of Barristers. The senior managing partner at Provost and Umphrey Law Firm in Beaumont, Umphrey is well known as co-counsel, along with Wayne A. Reaud, Chairman of the Board of the Beaumont Foundation, in the historic $17.3-billion settlement for Texas residents against the tobacco industry in 1998. Walter is board certified in the areas of Personal Injury Trial Law and Labor & Employment Law by the Texas Board of Legal Specialization. He is a Fellow of the International Society of Barristers. He was selected for inclusion in Texas Super Lawyers, a Thomson Reuters Business, 2003-2012, an honor only 5 percent of the lawyers in the state are selected for annually. In June 2000, Umphrey was recognized as one of the top Texas lawyers of the 20th century in the Texas Lawyer publication "Legal Legends: A Century of Texas Law and Lawyering." Texas Lawyer also named Umphrey as one of the 25 greatest Texas lawyers of the past quarter-century in its special 2010 anniversary issue. Additionally, Umphrey has been recognized for his contributions to the legal community by countless organizations, including receiving the prestigious Blackstone Award from the Jefferson County Bar Association. Beyond the practice of law, Walter has provided unwavering support to important civic and community causes. He serves as director of the National Wildlife Association, director of the LadyBird Johnson Wildflower Center, director of both Texas Regional Bancshares, Inc., and CommunityBank of Texas. Umphrey helped build the new Sheila and Walter Umphrey Law Center on the banks of the Brazos River at Baylor University that is hailed as a state-of-the-art educational facility. Recently the couple made a generous gift that will support construction of the Sheila and Walter Umphrey Bridge at Baylor Stadium connecting the new stadium with the law school across the Brazos River. The newest cancer institute in Southeast Texas was named the Walter Umphrey Cancer Center. An annual sponsor of “Gift of Life” breast and prostate cancer initiatives, Walter Umphrey provides unparalleled support to important civic and community causes, ranging from cancer screening to education to conservation. Umphrey has been very generous to Lamar University as well through the years, supporting LU athletic programs and Le Grand Bal for many years. In 2005 a $5 million gift was recognized in the naming of the Sheila Umphrey Recreational Sports Center when it opened in 2007, and a combined gift of $3 million from the law firm and an additional $1 million from Sheila and Walter Umphrey was recognized in the naming of Provost Umphrey Stadium in 2008 prior to the resumption of the football program at Lamar. , John G. Tucker, and Bob Wortham. “We are grateful to the Beaumont Foundation of America for its commitment to Lamar University and the underserved individuals who will benefit from this generous endowment for years to come,” Simmons said. The Beaumont Foundation of America, created in 2001, is a non profit grant making institution dedicated to enriching the lives and enhancing the futures of less fortunate children and youth, families and the elderly. The foundation provides grants and scholarships to a broad range of charitable, religions and educational organizations across the United States. “The foundation is focused on the underserved and that mission starts with a fundamental reality of our global economy — education is essential for a successful life,” said Frank Newton, president and CEO of the foundation.